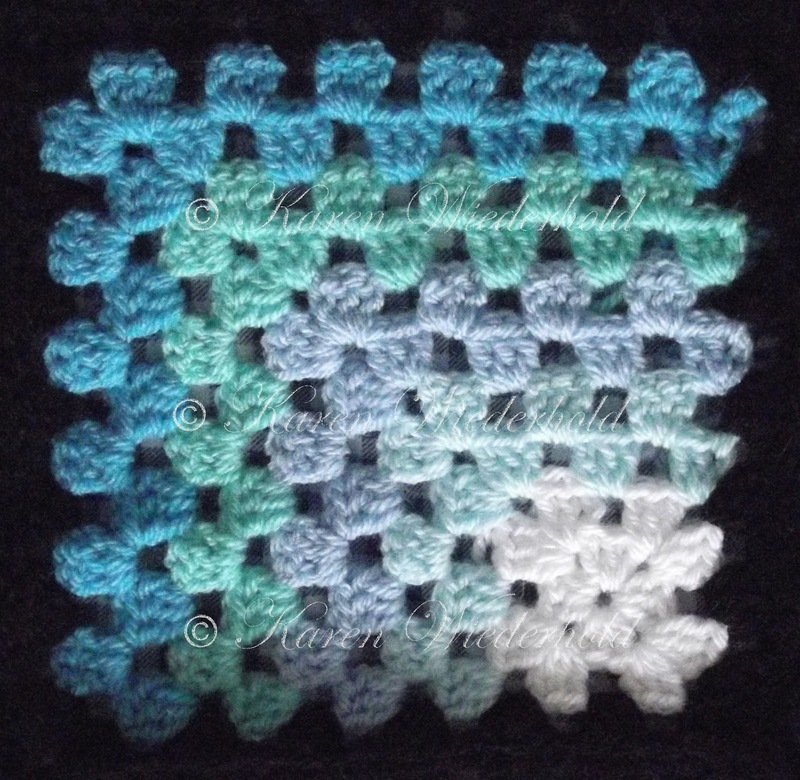 I came up with the design for this square because i'd become a bit bored with the regular square granny. I'm really please with the whole effect of the mitre effect and the shading it gives. I'm busy working on this blanket at the moment and thought i'd share the pattern so that you could join me if you have an empty hook and yarn looking for a project. I used Stylecraft Special DK yarn and a 3.5mm hook. With white yarn Ch 5, join with ss to form ring. Ch3 (this acts as dc), dc 11, ss into space between first and second dc's to join. Ch3 (this acts as dc) dc2 into same space as ss of previous row, ch2, dc3 into same space. *Ch2, skip 3 dc's then dc3 ch2 dc3 into space *. Repeat * to * twice more. Ch2, ss into space between first and second dc to join. Tie off yarn. Join on next colour yarn into corner space. Ch3 (this acts as dc) dc2 into same space. Ch2, dc3 into centre two chain space, ch2, dc3 ch2 dc3 into corner space, ch2, dc3 into centre two chain space, ch2, dc3 into corner space. Turn piece over so you are working back along the row just created. Ch4, dc3 into space, ch2, dc3 into next space, ch2, dc3 ch2 dc3 into corner space, ch2, dc3 into space, ch2, dc3 into space, ch4, join with ss into top of last dc. Tie off yarn. Repeat in the style of rows 4 and 5 until your square is as large as you like. I have used four colours in addition to the white centre. I am making a blanket for a single bed so my rows are made up of 10 squares. Once you have made enough squares for your preferred size row, join together using the "join as you go" method in black yarn. 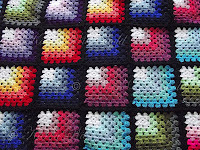 Make enough squares for your next row, then join them to the previous row of squares, off-setting them by one so that the pattern develops diagonally across the blanket. A helpful video for the join as you go method is HERE. beautiful! shading like a quilt. How do you do the "join as you go method" to join the squares together? 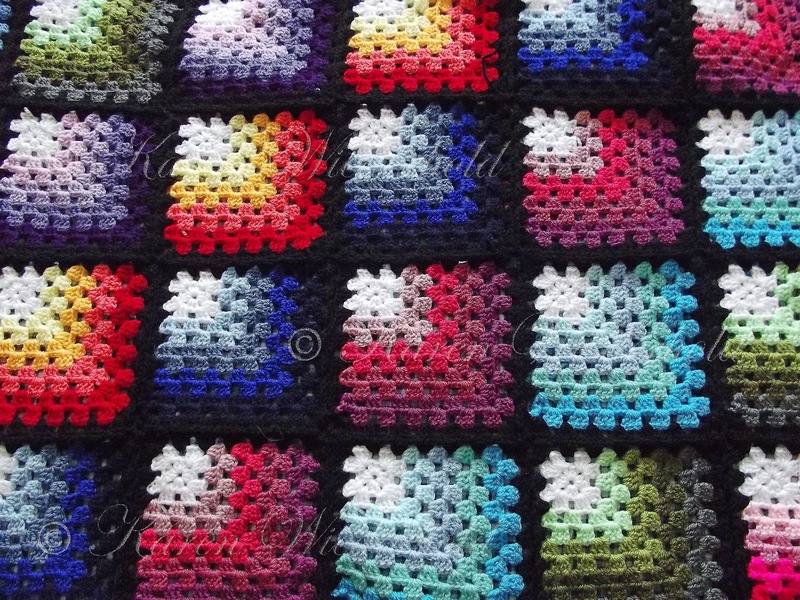 I am making a blanket similar to this but the squares are smaller for my baby granddaughter. I love the colors that you have chosen! Can you help me? The join as you go method is demonstrated on you tube, I have now added a link to the pattern post for you to click on. Alternatively cut and paste this text. I just found your blog and I am glad. Your blog is wonderful. I love your craftings. Thank you for sharing. I love this Granny Square pattern. I find Granny Squares are about the most versatile crochet style ever. I often divide them on the diagonal and do quilt block patterns. So fun! This is beautiful! I saw it on Facebook, someone shared the link. I will try to work on this after I complete a couple more projects. This one will be for me. Thank you for sharing! I plan on making this for a wedding gift. Does anyone know how many yards it takes to make an afghan 10 squares wide and 15 long? 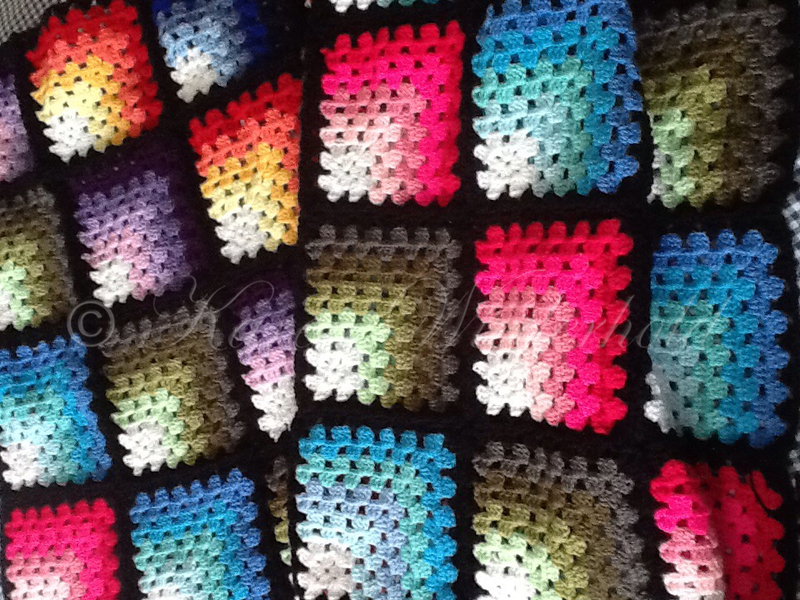 I like the colour combinations in this afghan and Loops & Threes Impeccable has over 25 colours so it should work out. Does anyone else have a recommendation for a yarn with a lot of colours that would give a stained glass effect like this one does? Very lovely and lots of possibilites. Thank-you for sharing this with us. I think I just found a beautiful way to use up my extra yarn and make next year's Christmas presents! This is so pretty! Love this pattern and look forward to giving it a try. Thanks for posting it so we all can use the pattern. Karen there's amissing, what's the size crochet hook and how many grannies? Love this pattern! this pattern is awesome...I am so going to make this! I just wanted to say thank you for the beautiful pattern. I was looking for a modern take on the granny square for a baby gift for a dear friend. This is perfect. I'm glad you are all enjoying this pattern so much. going to try this with some leftover yarn. Thanks for the pattern. Pretty squares, am going to try this with some extra baby yarn, using white for the borders. Karen - I've looked at your project so many times and just have to tell you -- this is wonderful. After studying your colors, I'm trying something similar using the traditional sunburst pattern + cornering as you have done. Thank you for the inspiration!! Awesome. I am giving this a try now to make for my daughter serving in the Army. Thank you so very much for sharing! Hi Karen, I love your blanket. I am going to make it for my daughters bed this autumn. Thanks for sharing. Cisca, Netherlands. Beautiful blanket, could you share the Stylecraft shades you used please. Beautiful blanket, can you share the Stylecraft shades you used please. I love this, such a beautiful color combination!